Are you ready for another wonderful year in the mountains with a lot of activities and fun things to do? Well, let’s get this year rolling! The Butte Theater will be having free movies on the 1st and 3rd Thursdays this month and next. Movies are $0.00/free (donations are accepted) and start at 6 p.m. Of course, the concessions and the bar will be open on movie nights. January 17th will bring “Breakfast at Tiffany’s” to the big screen for your enjoyment, so be sure to mark your calendars and come to the Butte! 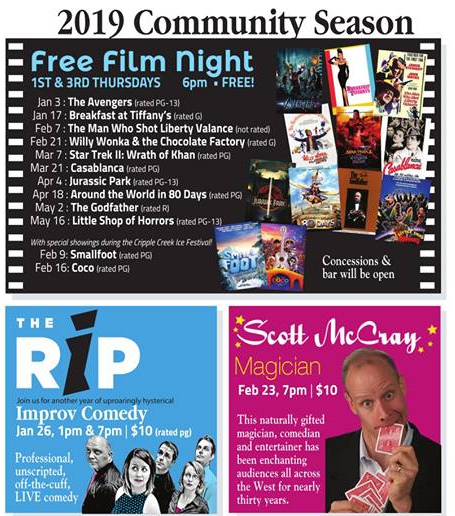 The Butte Theater will also be offering RIP Improv Comedy on the 26th of January at 1 p.m. and 7 p.m. Tickets are $10 each. This will be a fun time with live, professional, unscripted comedy, so you won’t want to miss it! Note: The Butte’s website is under construction, so there are no links attached to this. You can call them at (719) 689-6402, contact them on Facebook at https://www.facebook.com/ButteTheater/, or by looking up the Butte Theater on Facebook. We hope to see you at the Butte and the Grange!